For non-Japanese speaker, please see the English index page. 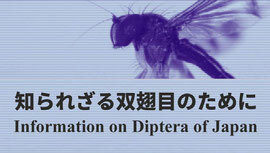 The catalogues of the Diptera of Japan were released on September, 2014. 124 families, 1668 genus and 7658 species are listed on these catalogues. 記載論文: Iwasa, M. (2019) Contribution to the knowledge of the Japanese Milichiidae (Diptera), with descriptions of two new species. Zootaxa, 4551(5): 571–582. • Prosimulium kazukii sp. nov.
記載論文: Takaoka, H., K. Saito, P. H. Adler & M. Baba. 2018. A new species of black fly with a yellow thorax in the genus Prosimulium (Diptera: Simuliidae) in Japan. Zootaxa 4524(4): 489–495. • Tanytarsus trichovalis sp. nov.
記載論文: Kodama, A., K. Kawai, H. Saito. 2018. A new species of Tanytarsus van der Wulp, 1874 (Diptera: Chironomidae) and the first Japanese record of Tanytarsus ovatus Johannsen, 1932 with DNA barcodes. Zootaxa 4422(4): 591–599. • Orthocladius (Nothorthocladius) brevistylus Yamamoto, Yamamoto et Tang, sp. nov.
• Yaethauma longiligulata Yamamoto, Yamamoto et Tang, sp. nov.
記載論文: Negrobov, O.P., T. Tago, O.O. Maslova 2018. A new species of the genus Nematoproctus (Diptera: Dolichopodidae) from Japan. Zoosystema Rossica 27(2) 192-195. 記載論文：Yonetsu, A. Y. Shinogi and M. Watanabe 2018. Hybomitra litoralis sp. nov., a new species of the family Tabanidae (Diptera) from Japan. Medical Entomology and Zoology 69(1) 13‒18. *Dicranomyia (Erostrata) reniformis sp. nov.
*Dicranomyia (Erostrata) submelas sp. nov.
*Dicranomyia (Erostrata) yazuensis sp. nov.
記載論文: Kato, D., T. Tachi, J. Gelhaus 2018. Revision of the subgenus Dicranomyia　(Erostrata) Savchenko, 1976 (Diptera, Limoniidae) of Japan. Zootaxa, 4441(1), 181-194. 記載論文: JASCHHOF, M. and V. SPUNGIS 2018. Towards reliable identification of male Dicerura: descriptions of three new and seven poorly known species in the Palearctic region (Diptera: Cecidomyiidae, Porricondylinae) Zootaxa, 4422(1), 85-103. * Meoneura issunboshii sp. n.
記載論文: Stuke, J. H. & T. Tago 2017. A new species of Meoneura Nitzsch from Japan (Diptera: Carnidae). Bonn zoological Bulletin 66(2) 177-181. 記載文献：Iwasa, M. 2017. The Insects of Japan vol.9 The family of Sepsidae (Diptera). Touka shobo, Fukuoka. 180pp. 記載論文: Evenhuis, N.L. & Ichige, K. 2017. A new species of Thevenetimyia Bigot from Japan (Diptera: Bombyliidae). Bishop Museum Occasional Papers. 122:1-6. * Microtendipes parachloris sp. n.
記載論文: Tang, H., Niitsuma, H. 2017. Review of the Japanese Microtendipes (Diptera: Chironomidae: Chironominae), with description of a new species. Zootaxa 4320(3) 535-553. * Rheocricotopus longiligulatus Yamamoto & Yamamoto sp. nov.
記載論文: Kurahashi, H. & Sagara, M. 2017 A New Species of the Japanese Xenotachina Malloch (Diptera: Muscidae). Japanese journal of systematic entomology 23(1): 119-122. 記載論文: Salmela J, Kolcsár L (2017) New and poorly known Palaearctic fungus gnats (Diptera, Sciaroidea). Biodiversity Data Journal 5: e11760.